It is our commitment to provide the best nutrition for your feline family member. Kittens have unique dietary needs. AVP is proud to offer a leading kitten formula that delights all kittens. Cats grow up to be carnivores. Our complete kitten formula provides excellent protein and fat levels through our inclusion of animal origin ingredients to provide the nutrients your kitten needs to thrive and grow. We use chicken as the major highly digestible protein source in our "Love of Chasing Feathers" formula. Every ingredient has been cautiously chosen for its range of nutrients that work synergistically to support well-being. All AVP formulae are completely natural with added vitamins and minerals. No synthetic preservatives are added. Not only is our food expertly formulated to deliver the best in nutrition, but it is also a tasty delight. Your kittens will love and devour every day. Fully support three stages of life - gestation, lactation and growth. 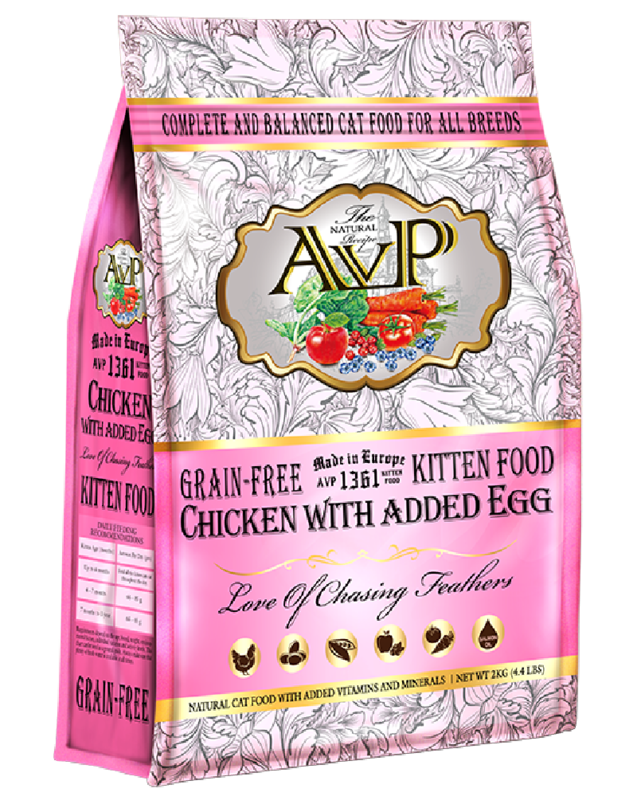 AVP®1361 Love of Chasing Feathers™ Chicken with added Egg Grain-Free Kitten Food is formulated to meet the nutritional levels established by the AAFCO Cat Food Nutrient Profiles for growth, gestation and lactation. Ingredients: Chicken, Chicken Fat, Sweet Potatoes, Peas, Lentils, Hydrolyzed Chicken Protein, Chicory Pulp, Brewer’s Yeast, Dried Whole Eggs, Salmon Oil, Apples, Carrots, Flaxseed, Cellulose, Vitamins and Minerals, Blueberries, Cranberries, Tomatoes, Spinach, Yucca Schidigera, Rosemary Extract.